Olli and Robert pulled my kayak to the edge of the creek at Cotton Landing, just north of Cypress Springs. I looked to the south, at the winding waterway, shaded by cypress and oaks. “Is the entire paddle like this?” I asked. Beautiful. I’m not sure why it surprised me, but it did. And now, knowing that this would be a great paddle helped make up for the port-a-potty, my only restroom option. A quick stop, and I finished packing my gear into the kayak, secured my cooler, and climbed in. Olli gave me a shove into the water, and I paddled away, smile on my face. I had almost missed this one, Holmes Creek. For some reason, it seemed insignificant on the map. It originates a few miles north of the Florida- Alabama border. 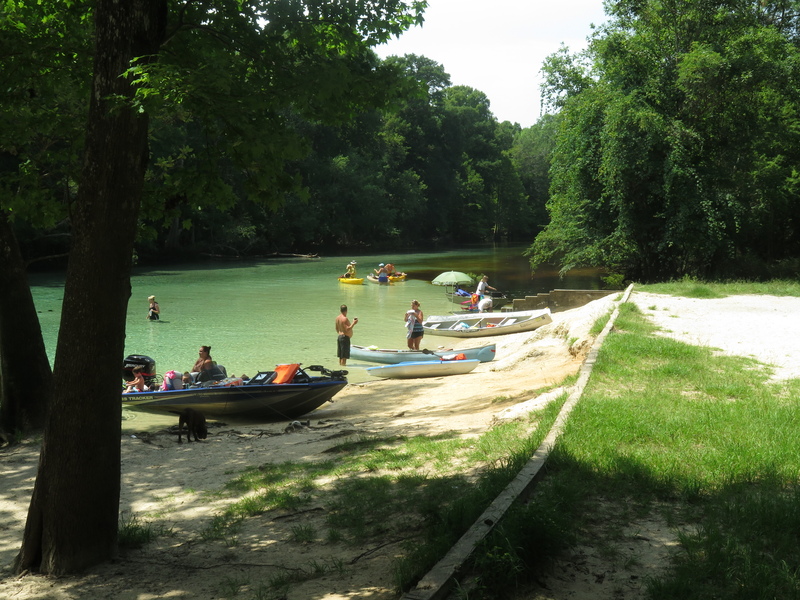 Its length includes about 20 miles of State Designated Paddling Trail between Cotton Landing and Live Oak Landing before it flows into the Choctawhatchee River. I’m not even certain that the portion I paddled from Cotton Landing is part of the official paddling trail. I often see paddles beginning a few miles south, around Vernon. 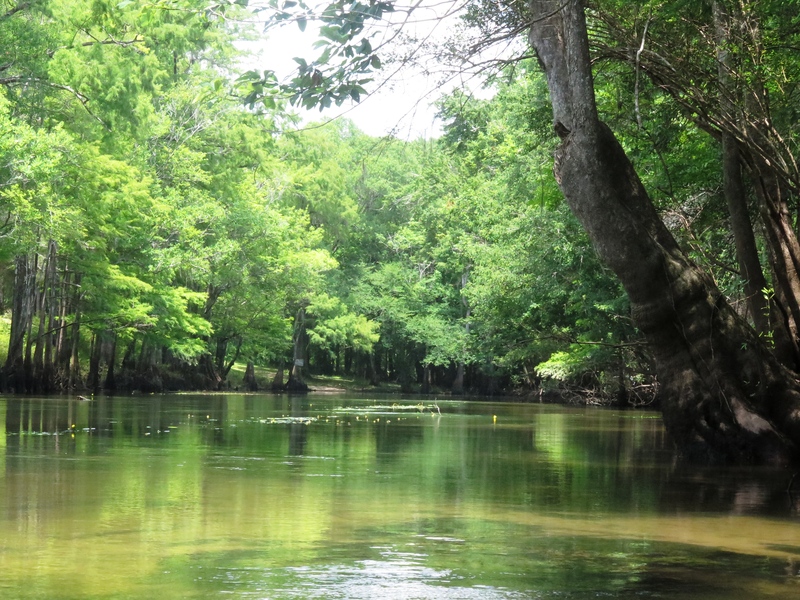 I paddled, taking in the beautiful forest of cypress, oak, tupelo, and sweet gum which seemed to snuggle and curve around the river. I had seen the water described as “emerald green,” but today it was cloudy and murky; I could not see the bottom of the creek. Robert had explained that recent rains had churned it up. The trees around me were…noisy! The sounds of the birds grew louder as I paddled. “She’s coming! She’s coming!” they seemed to scream. springs. Missy and Larry talked about the history of the springs. Larry said that it is a manmade springs, dynamited and then connected to the creek. (I need to check this out.) I paddled around the springs for a bit, a perfect spot on a hot day. From the springs, I had about a 3-mile paddle back to the outfitter—1.5 hours. I passed an occasional kayaker or small boat, but the creek remained peaceful. Although the current was light, it required little effort to paddle. My paddle was scenic and lovely. I attempted to find Becton Springs and paddled up another small waterway. Somehow, I managed to miss the orange dot and lost my way for a bit, never seeing the springs. Oh well, a good reason to return someday!